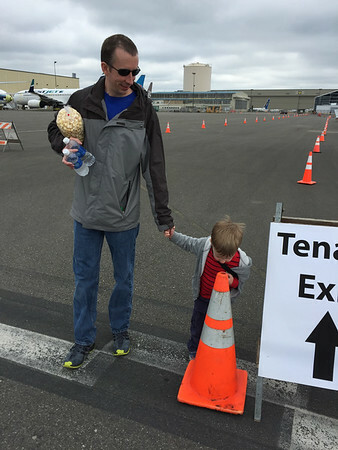 Our own airplane is down for the annual inspection so we opted for visiting the airport to check out General Aviation Day at Paine Field. We were able to see many of the old airplanes fly, including this Hellcat, which is the type of plane Rob’s Grandpa Chuck flew. In this picture Great Grandpa Chuck is on the left. 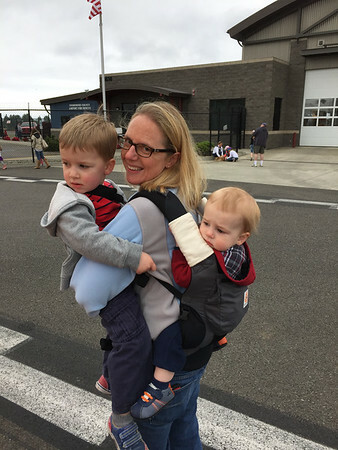 Showing off the double koala carry which has been mastered this past week with our recent injuries. As always Cooper keeps us laughing. One of the highlights, perhaps “the” highlight for Cooper of aviation day was checking out what was inside each of the cones on the way back to the car. 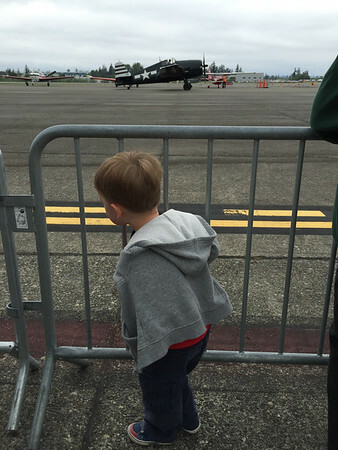 He is definitely catching his Daddy’s love of airplanes, but he is also almost 3 so there are many distractions everywhere we go.